In the early 1960s learning to love Barcelona required, among other things, an act of will. The city was not, on its surface, attractive; its charms lay hidden beneath a dowdy, scruffy appearance. The heavy hand laid on the city by Franco after the Civil War stifled even the modicum of liberty essential for urban culture to thrive. Still, lovers of art, who often have more porous political consciences than other members of the intelligentsia, were better served by Barcelona than the casual tourist. (Many Americans still harbored intense feelings about the Civil War and refused to set foot in Spain.) The Old Quarter, known as the Barri Gotic, with its medieval cathedral and houses, was richly atmospheric and pungently aromatic; the plumbing, like the architecture, was centuries old, and the genteel, antiseptic charms of gentrification still lay some twenty years in the future. Informed travelers could next make their way to the Museu d’Art de Catalunya on Montjuic to study the fabulous Romanesque mural paintings, which fortunately had been removed from the small churches in the Catalan countryside and thus spared the ravages of time and the fury of anarchists. The museum was almost always empty, and it was easy to be overpowered by those out-sized, wide-eyed twelfth-century divinities. This artistic itinerary was exceptional in one respect: it listed no monuments created between the late Middle Ages and the middle of the nineteenth century. Of course, life did not cease in Barcelona during those 350 years. Something worse happened: the city fell under the power of the central government in Madrid, which alternately ignored, exploited, or repressed it, reducing it to the status of a small, provincial city. When at last Barcelona began to re-emerge as a thriving center for commerce and industry in the 1850s, and money was available for new building projects, architects cast a nostalgic eye toward the last great epoch in Catalan history, the period from the mid-twelfth century to the end of the fourteenth century, when the region was an important Mediterranean power. The splendid buildings that arose during the Catalan renaissance, or Renaixenia, are thus situated at the crossroads between art and regional nationalism. They are as complex as they are compelling. And these were the buildings that aroused the enthusiasm of the youthful Robert Hughes, who claims, as an Australian, an innate affinity for what he calls the provincial. The act of will needed to see beneath the tatty surface of Barcelona in the 1960s was almost second nature to him, and he was launched on a long-term engagement with the city that is once again known, not least as the host to this year's Olympic Games, throughout the world. The political and economic history of Barcelona is written all over its plans and buildings, and one cannot begin to understand Catalan architecture—particularly that of the nineteenth century, when it was such a forceful expression of national aspiration—without the image bank of local identity that lay behind it. The issue of local identity looms large in Hughes’s book, as it is beginning to do in historical studies in general. It is logical to suppose that the renewal of interest in the regional and the local is linked to the major geopolitical changes of the last decade: the projected unification of Western Europe has made its inhabitants more aware of what they perceive to be their historical differences, which are threatened with extinction by the emergence of a new megastate; and the disintegration of the old and vast megastate to the east has really let the cat of nationalism out of the bag. Myths of origin and cults of authenticity, in short, are returning to favor. Duly sanitized of their association with the darkest moments of Western history, and presented with conviction, these things can have an enormous appeal, as Ronald Reagan showed during the two terms of his presidency. It is still too soon to identify the effects of the new local identities with any confidence, but as far as the visual arts are concerned, one consequence is clear. More and more, art historians are questioning the “canon,” that rather exclusive group of artists and works of art that are used as the benchmark for measuring aesthetic and cultural quality. In the modern criticism of art, the charge of provincialism has always been a grave one. It is commonly assumed that the cosmopolitan is more innovative, more valuable, more challenging; in short, that it is better. This exclusivism is now being questioned, and recognition of other art, recognition without condescension, is now being demanded. The situation in the visual arts hasn’t yet attained the sophistication and the shrillness of contemporary literary studies, in which received notions of excellence are being subjected to a hostile analysis, often from a political standpoint, that attempts to expose the ideological content presumed to be latent in the concept of the masterpiece. In the visual arts, the outcome of the struggle over who controls the definition of excellence is still far from clear; but it may be that the definition will be usefully enlarged by the new points of regard. In this respect, the genuinely open-minded study of local identity exemplified by Hughes’s book gives one grounds for hope. As Hughes is quick to say in his preface, his book is not scholarly or academic. Its essential information is derived from secondary sources, which are cited in the bibliography. Its strengths are to be found, rather, in its author’s engaging style of writing, his keen and concise analysis of particular works of art, his ability to sustain an engaging point of view over more than 500 pages of text (which are illustrated, unfortunately, with deficient reproductions). By now Hughes is renowned as the master of an informal but analytically penetrating prose style that catches the cadence of his speech (at least as it comes across on television) and his penchant for earthy colloquialisms. He is an extremely congenial guide through almost two millennia of Catalan history. His point of entry determines his slant on his subject. During the last twenty-five years, the fame of Barcelona as a thriving artistic center in the late nineteenth century has grown. The names of Gaudi and Picasso, the latter of whom started his career in the city, are proof enough that Barcelona was no run-of-the-mill town, even if textiles were the principal industry; and around these stars clustered lesser but still radiant lights, who constituted the constellation called modernisme. The architects Lluis Domenech i Montaner and Josep Puig i Cadafalch designed some of the most flamboyant and inventive buildings of the period, which only recently have been lovingly restored. Domenech’s Palau de la Musica Catalana, a concert hall completed in 1908 for the Orfeo Catala, a choral society, is a Wagnerian opera in three dimensions, swarming with surface energy, overladen with nationalistic symbolism. The Casa Amatller by Puig, now home to an institute of art history, performs an inventive modernista turn on the Gothic style so beloved by these architects. The artists who made up the group known as Els Quatre Gats also have come in for a share of glory. Els Quatre Gats was a beer hall started by four painters, Pere Romeu, RamOn Casas, Santiago Rusinyol, and Miquel Utrillo. Part fraternity house, part artists’ club, it was the center of Barcelona’s Bohemia, and the place where Picasso used to hang out. His reputation overshadows Casas and Rusinyol, of course, but they were very good artists indeed. They were in Paris in the 1890s and sampled the various brands of modernism, which they transformed into an authentic medium for interpreting the peculiar culture of their native city. The renascence of high-level artistic activity in a city where it had long and conspicuously been lacking is the phenomenon that Hughes seeks to understand. As he puts it, “So much of what was built in Barcelona in the late nineteenth century was grounded in a strong, even obsessive, sense of the Catalan past, in particular its medieval past, that there was little point in trying to describe the newer without the older.” Accordingly, his book is divided into two roughly equal parts. “The Old City” is a fast-paced historical travelogue covering the first 1,850 years of the existence of Barcelona and Catalunya, the surrounding region of northeastern Spain, bordered by the Pyrenees to the north and the Mediterranean to the east. This is designed to set the stage for the densely woven narrative of “The New City,” which is more tangled and more ambitious. The long, initial phase of Barcelona’s history can be described as an arduous climb up to a peak of glory, followed by a quick slide into a valley of obscurity. Though it was settled by the Romans, Barcelona did not begin to be significant until the twelfth century. In 1137, to be exact, Catalunya merged with the adjacent kingdom of Aragon, forming a solid block of territory and power, and spilling over into Roussillon. Barcelona was the capital of this new state. During the reign of Jaume I (1213-76), the kingdom of Aragon launched the expansion of an empire eastward as far as Constantinople, building a trading network that brought great prosperity to the region. 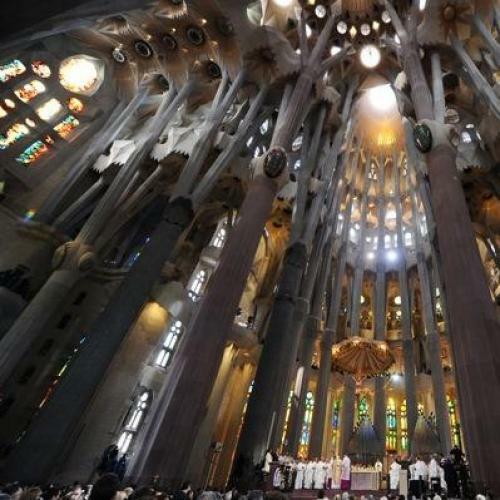 No matter how secure Barcelona felt, no matter how impregnable it was, its church architects obdurately kept the image of the fortress in their minds. No matter how high, long, or wide their buildings were, they retain a ghost memory of the cave, the strong troglodytic God-shelters of the Pyrenees, of Catalunya Vella. Hughes employs the Catalan language to refer to the names of people and places of the region. Spanish would be unthinkable, even for a writer with Hughes's impatience with the politically correct. Catalan is an independent Romance language, but more to the point, it is independent from Spanish, which is derived from a more formal, cultivated Latin. Yet Catalan has only sporadically been used as a literary language, which explains its second-class status compared with other Romance languages, despite the fact that it made a splendid start. It is certainly no coincidence that the foundations of literary Catalan were laid as the Gothic buildings were rising. The central figures are Ramon Llull (c. 1235-1316), one of the greatest medieval philosophers, and the troubadour poet Ausias March (c. 1397-1459). After this moment of glory, however, written Catalan virtually disappeared until the nineteenth century, as a consequence of the collapse of the Kingdom of Aragon as an independent nation. The history of the decline of Catalunya during the fifteenth century appeals mostly to students of economics and political factionalism, and clearly Hughes is not one of their number. As the first golden age of Catalunya draws to a close, the pace of his narrative accelerates to blinding speed; and after the dust settles, Ferdinand of Aragon has married Isabella of Castile, a union that made Catalunya the junior partner in the future development of Spain. From the first, the Union of Crowns was a misalliance. Castile, which then comprised all of the Iberian Peninsula except Portugal and Aragon, was a society ascending, and soon it would be the center of a world empire. In this order of things, Aragon (which in historical terms always includes the principality of Catalunya) became an appendage, denied the fruits of the Spanish monarchy but expected to contribute men and money to its wars. The history of Catalunya over the next three centuries, mercilessly condensed to its essentials, is the history of futile attempts to escape this exploitation by the government in Madrid, which bypassed local civic institutions and ruled through a viceroy. It is also the story of the fitful progress and eventual success of the Catalan economy, which culminated in the late nineteenth century with the enrichment of a handful of manufacturers and the exploitation of their workers. The second golden age of art in Barcelona was created when these makers of money joined forces with makers of myths. In the aftermath of the Napoleonic Wars, Catalunya discovered its soul, that is, its language, its history, and its folkways, in the Renaixenia. The Renaixenia was one of many movements of regional nationalism that swept Europe in the nineteenth century. (It is a force that, after several decades of dormancy, is again becoming significant: there are now said to be forty-two regional movements in Western Europe alone.) According to Eric Hobsbawm, a keen student of the phenomenon, regional nationalists staked their claim to nationhood on two points -- language and ethnicity, which were mixed together in a powerful cocktail of patriotism. Nothing seems more natural or spontaneous than patriotism, but nothing is more susceptible to manipulation. At the heart of regional nationalism is the rewriting of history; a careful selection is made of events that lend themselves to the exaltation of a political program and its proponents. Thus mythologized, the past, at once remote and proximate, can be used to advance a wide range of nationalistic aspirations. Nationalism also demands a repertory of symbols, which run the gamut from flags to statues of the founders and heroes of the nation, and this is where artists get into the act. Of course, patriotic art is most often associated with its extreme manifestations, as exemplified by Soviet realism, Nazi neoclassicism, and (we are now being told) representations of the American West. Still, it need not be so coarse or so blatant, as Hughes nicely demonstrates by situating the architectural masterpieces of modernisme in the politics of the Renaixenia. The search for the artistic roots of the Catalan soul could lead only to one place—the Barri Gotic, the Gothic past, one of the key points in the mythology of Catalan history. Architects of the modernist school interpreted the Gothic with varying degrees of liberty, as was only to be expected. Domenech, a flamboyant designer, kept up with the latest developments in Paris; Puig, a devoted and pioneering student of Catalan medieval art, was more archaeological in approach. Gaudi was another medievalizer, and the only member of the group who saw through the skin of the Gothic style to its structural achievements, as evinced in the amazing crypt for the chapel of the Colonia Guell. Gaudi’s last work, the unfinished church of the Sagrada Familia, has become the most famous modernista building, and it is now routinely used to promote the image of Barcelona. Yet it was commissioned, as Hughes explains, by a right-wing religious organization that carried the ideas of the Renaixenia to an extreme of pious xenophobia. (Its leader even refused to eat French food, the sure sign of a twisted mind.) The familiar, spiky towers of the Sagrada Familia were designed, in other words, to be minarets of antimodernism. No wonder that construction stopped with the death of the architect, whose own views by then were not far removed from those of his patrons. The misguided souls who are now bending every effort to complete the church have no more sense of history than of taste. Hughes's lucid account of modernista architecture raises the question of regional or national style not only politically, but also analytically. What exactly are such styles? How do they come into being? At any moment, works of art emanating from a given region assume common characteristics; this is what makes it possible for a trained eye to distinguish, often at a glance, a Renaissance painting done in Italy from one done in Flanders, or even a Florentine work from a Sienese work. With good reason, however, the study of the formation and the character of national styles has been treated with circumspection. Too often the explanations of these aesthetic and cultural phenomena have fallen into the trap set by the nationalist movements of the nineteenth century, that is to say, into the belief that the inhabitants of a certain region are innately imbued with spiritual characteristics that endure over time. In Spain, for example, the term invariantes castizos has been used to describe the unchanging essence of the Spanish character, which is manifest in everything that is truly Spanish. Such sweeping and tendentious definitions only flatten or eliminate the constantly changing responses of artists to new ideas and circumstances, and thus they have precisely the opposite consequence from the one they intend: they impoverish the artistic history of the people that they wish to glorify. They reduce history to propaganda. Hughes's enthusiastic but untendentious book, though it has no theoretical pretensions whatsoever, provides an excellent example of the study of a regional style by what might be called a circumstantial approach. It involves the study of the creation of cultural identity within historically coherent blocks of time and geographically finite spaces. Within these parameters, the local roots of works of art can be identified, which in turn allows a much more precise definition of their special characteristics. And these limitations severely inhibit or make altogether impossible the process of mythologization by which framers of regional identity seek to glorify themselves and their kind. The architecture of modernisme offers a clear-cut demonstration of the value of such an approach. Although broadly classified as an art-nouveau style, it is easily distinguishable from other manifestations of this international style, from the original art nouveau in Paris, from the Secession movements in Vienna, Berlin, and Munich, from the work of Mackintosh in Scotland, and also from the Arts and Crafts Movement in the United States. These differences, as Hughes explains, can be traced to the Renaixenia and its program to construct a sense of nationhood by exalting the language and medieval past of Catalunya. The founders and the proponents of this movement in the early decades of the nineteenth century belonged to the middle and upper-middle classes, the social groups that tend to sponsor regional movements. (The lower classes have nothing to gain, and the upper classes have too much to lose, from patriotic movements, especially those with separatist ambitions.) By mid-century the Renaixenia had entered the arena of public awareness through such vehicles as the Orfeo Catala and the Jocs Florales, or Floral Games, an annual literary competition modeled on a medieval antecedent, which tried to elevate the values of eternal Catalunya through the medium of bad poetry. In the 1880s the ideas of the Renaixenia began to percolate up the social scale, and this gave the architects their opportunity. Patrons such as Eusebi Guell, the richest man in Barcelona, employed Gaudi to adapt the Renaixenia to the tastes of the carriage trade. Medievalism was a la mode, and therefore it was taken by the modernistas as malleable clay for their inspired flights of imagination. The sumptuous interiors of the palaces that they built on the fashionable Passeig de Gracia also betrayed the influence of the movement, particularly in the use of ironwork, long a speciality of the regional craftsmen. But there austerity stopped: the fixtures and furnishings created for the residences of Barcelona's new rich are ostentatious objets de luxe. Hughes’s study of Barcelona proves that elitism need not be the same thing as intolerance, that the sympathetic study of regional art can open eyes and minds to forms of artistic expression that are not taken seriously by the guardians of quality. It is pointless, for example, to compare a Baroque church in Rome with a Baroque church in Puebla or Lima, if the standard of excellence is to be defined by the examples of Bernini and Borromini. Spanish Colonial architecture is a quaint enigma in the English-speaking world because there is no available critical method for interpreting its chromatic, exuberant, sensuous style. Is it all bad? Is it all good? How do you distinguish levels of quality? Nor does it occur to anyone to look at the Roman Baroque from the Latin American perspective, which would probably regard Borromini's famous church of San Carlo alle Quattro Fontane as cold, abstract, and colorless. “There are two ways of disliking art, Ernest,” wrote Oscar Wilde in The Critic as Artist. “One is to dislike it. The other, to like it rationally.” This admonition to cultural relativists may seem apposite, but it was made by a snob and a dandy, smugly convinced of the rightness of his own taste. Culturally at least, the world has become a bigger place, and a more interesting place for those who are willing to consider new criteria of judgment. Those new criteria are now being contested; but the canon is not as vulnerable to this contest as some of its defenders fear. It seems safe to predict, at least about the visual arts, that as the furor subsides, the canon will have been expanded, and to the benefit of all concerned. A non-doctrinaire approach to art through the study of local identities, which will employ notions from anthropology as well as social, religious, economic, and political history, need not mean the end of excellence. Robert Hughes’s book is an elitist’s study of a provincial culture, but that is not quite the contradiction that it appears to be. Indeed, the fact that Hughes’s book is not divided against itself may be its most lasting lesson. Among its many other virtues, Barcelona itself demonstrates a credible way out of the cloisters of the canon, or rather a credible way of introducing scanted but worthy objects into it. Jonathan Brown is a professor at New York University’s Institute of Fine Arts and a writer on Spanish art. This article appeared in the May 18, 1992 issue of the magazine.